Germany is well-known for its many efforts to protect environment by recycling used material. As water is becoming a rare resource throughout particular parts in the world, it is of mayor interest to reduce freshwater and ground water use, too, in all sectors of consumption and to substitute fresh water by recycled water, even in households. Environmental sustainability demands conservation and increasing recycling of natural resources. Rainwater use is a possible solution, but not always practicable. 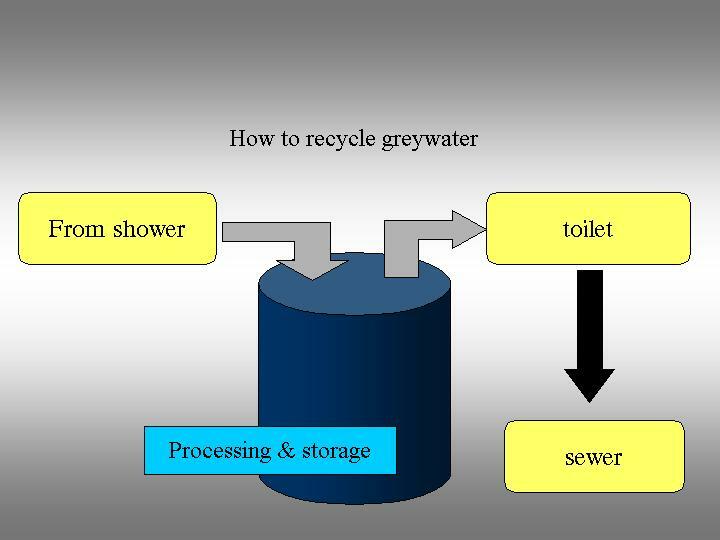 Greywater treatment and recycling of the here suggested kind can be adapted to most households in moderate climate countries where daily showering is as usual as the water toilet. If shower sewage is collected separately from other household sewage, its biological activity (BOD) remains low, particularly if it can be stored under cool conditions and only for a few hours. Then unoxic conditions that usually make greywater smell, will not occur. In the actual setup a smart design of several tubes (pat.pend.) provides sedimentation, filtration, overflow, precipitation of sludge and a standby function with tab water. 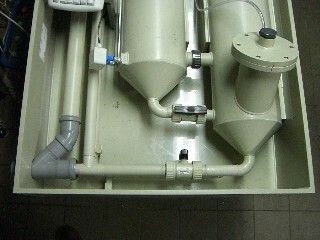 The greywater recycling device consists of a couple of vertical and communicating tubes made of PP, which are linked in a particular way to enable greywater to sediment, to purify, to overflow and so on, to contain the pump and the electrical elements for control. where greywater can be stored at a maximum temperature not exeeding 17 Co. The greywater recycling device now exists in 7 units in Germany designed and erected by the author, all in constant use by households of 1 - 5 persons. The total time of operation under non-laboratory conditions adds to 30 years (Feb. 2000). As the device is self-cleaning and the sludge is precipitated automatically a maintenance is not necessary. A yearly check will usually be sufficient. This photo gives an idea of the possible layout (detail). Yet there is not much information on the degree of contamination of greywater by pathogenic bacteria. It can be attempted that risks are very low if water is recycled within a family only. Actually first investigations on the spread of bacteria in greywater showed a low concentration as it would be accepted by European Law for rivers and lakes with the permission to bath and swim (Europaeische Badegewaesser-Richtlinie). The construction has been designed with utmost care for sustainability. Therefore there are nearly no costs for regular maintenance. Energy consumption is low and comes to less than 5 kW/h per cubic meter, which is about the same rate, that public water supply needs to process ground water to tap water and sewage to river water. It is more water used for body hygiene than for toilet flush in a WC. Therefore toilet flush water can be almost totally replaced by recycled water even in times of aridity. Depending on the local price of tap water and the amount of persons connected to the recycling system it takes only few years till the investment, due to un expensive production, becomes economical.